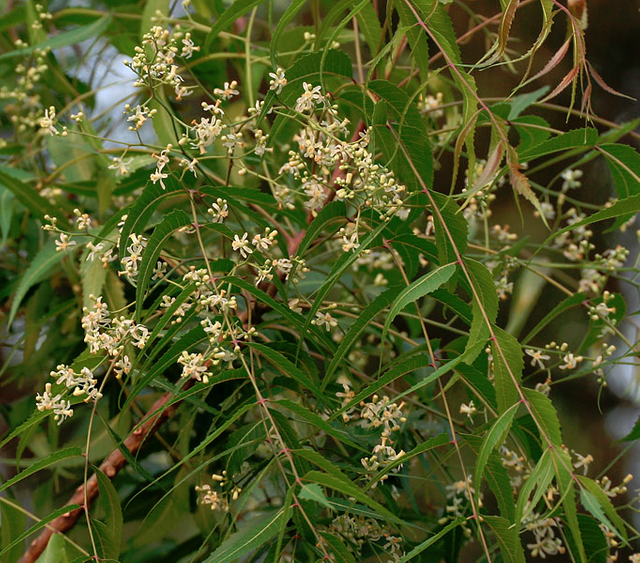 Azadirachtin (C35H44O16) is the active compound in the oil from the neem plant. (from Wikipedia)Farmers have been wielding neem oil against fungal and insect pests for centuries. When done properly, very little azadirachtin ends up in the food, because most plants can’t take it up through their roots. 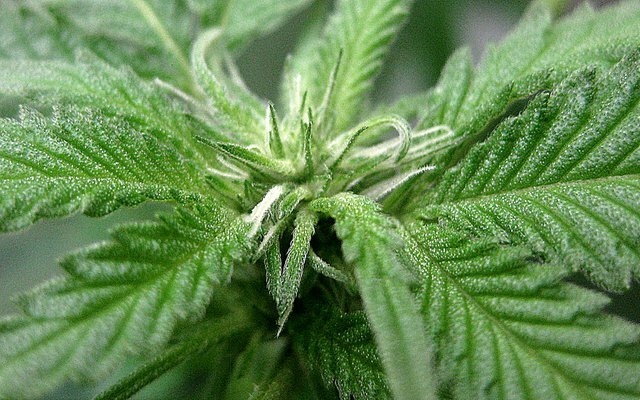 Cannabis is one of the best phytoremediators known – when grown in contaminated soil, it “cleans” the soil by uptaking heavy metals and other toxins. So it DOES uptake azadirachtin, especially during vegetative stage, then deposits it with resins into the flowers, which may be dried for smoking or made into concentrates. (photo by DRutter)Many (even organic) growers don’t know this, and continue to use neem oil with cannabis. Yes, it’s organic, but organic doesn’t mean safe. 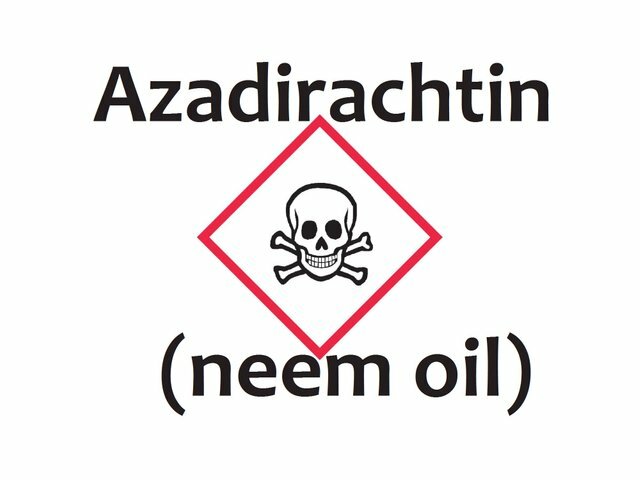 Azadirachtin is definitely poisonous. As much as HALF of all cannabis, including in dispensaries, is contaminated to some degree with azadirachtin! The early symptoms of azadirachtin toxicity are intense nausea, cyclic vomiting, abdominal pain, diarrhea, muscle tension, fatigue, and dehydration. Symptoms can be reduced with Benadryl (diphenhydramine) or a hot shower/bath. Those who are particularly sensitive to azadirachtin, those who are otherwise weakened or immunocompromised, and those who get the highest doses get the sickest. If levels get high enough, stupor, seizures, and organ damage result. Since 2004, various sources have been claiming that heavy cannabis use sometimes causes “cannabis hyperemesis syndrome”. This never-before seen illness supposedly has all the same symptoms as azadirachtin toxicity, and it clears up when treated in the same ways. As far as I can tell, “CHS” doesn’t exist. It’s actually toxicity to the active compound in neem oil (used sporadically on cannabis in the legal and underground industries). This nonsensical syndrome is being made into a Boogeyman by politicians to justify the continued prohibition of cannabis! We can dispel the CHS myth – and prevent people from getting sick – by spreading the word: NEVER use neem oil (Azadirachtin) on cannabis! This isn’t meant as medical advice, but I hope it spurs you to research the issue yourself. Other useful writeups on this topic can be found here, here, and here. If you have information you think I should add to this post, please let me know!